Casey Llewellyn’s O, Earth is a wild phantasmagorical riff updating Thornton Wilder’s Our Town and calling for toleration of sexual diversity. 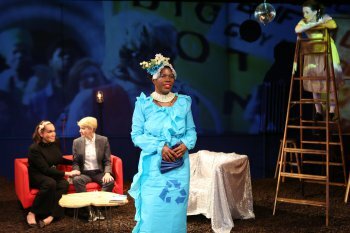 Using the original structure of the Wilder play (love, marriage, death) and adding gay, lesbian, transgendered and black characters, both historical and contemporary, the play asks how far we have come in 2016. While the props are mimed in the world of Wilder’s Our Town as originally written, the contemporary sections use real furniture and real props, continually shifting from one to the other. O, Earth has an agenda that at times verges on agit-prop, but The Foundry Theatre production directed by Dustin Wills is always surprising, always theatrical. The cast features an array of downtown luminaries in leading roles. 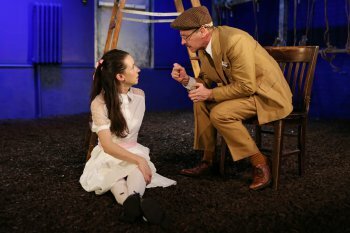 The play opens with a ghost light center stage and author Thornton Wilder (played by Martin Moran) in a 1930’s three-piece suit digging in a hill on stage left to find the time capsule buried at the end of Our Town. His labors are interrupted by the Stage Manager (Donnetta Lavinia Grays) from his play (now played by a black lesbian) who introduces us to the town of Grover’s Corners, New Hampshire, and a romance between classmates George (Jess Barbagallo) and Emily (Kristen Sieh). However, updated to contemporary terms, George is now a transgendered male and Emily is a feminist dissatisfied with the roles generally assigned to women. Wilder steps into his play and takes on the guise of choir director Simon Stimson, alcoholic and probably gay, who visits Emily’s family in order to watch The Ellen Degeneres Show. Switching to the present, Ellen (Moe Angelos)’ guests are gay couple Spencer (Ato Blankson-Wood) and Duncan (Tommy Helerlinger), loosely based on Spencer Stout and Duncan Reeser who performed a marriage proposal in the aisle of Home Depot that went viral. Both the satire and humor in the play are scattershot, sometimes hitting their targets and other times missing. Llewellyn’s point seems to be that although Wilder’s play dealt with the preciousness of life, while marginalized minorities remain invisible today (like the props in his play), no progress can be said to have truly been made. At times, this point is too baldly stated and seems like preaching. Other times, the author’s sarcasm is stinging, like when in a fantasy scene of Spencer and Duncan on their honeymoon in Hawaii, we find that they are more into joint credit cards and having an open relationship than living up to their recently won marriage vows. Nevertheless, Wills’ production is continually taking us by surprise both by his casting and his choices. His transgendered characters are played by transgendered actors. Moran’s Wilder and Angelos’ Ellen look a great deal like their counterparts, while Blankson-Wood and Heleringer as Spencer and Duncan, respectively, are a hoot as young entitled gay men who have totally bought into the capitalist system. “Mizz June” and Gentili, who are themselves transgendered icons, bring an air of authenticity to their roles as the colorful and outspoken Marsha and Sylvia. The production team has also helped create the style of the production. The unusual set by Adam Rigg combines the earth of the title, the hill needed for Wilder’s digging, the ladder for the George and Emily scene, doors that are not flush with the floor, a real TV studio and a real working kitchen. The uncredited video is streamed across the entire back wall of the set. Montana Blanco’s costumes run the gamut of 1900 clothes for the Our Town scenes, to the contemporary look of Ellen and Portia, to the splashy and ostentatious outfits of Spencer, Duncan, Marsha and Sylvia. The ambient sound design of Janie Bullard is much in evidence, while Barbara Samuels’ lighting follows the needs of the many locales of the story. The title O, Earth is a tribute to Wilder’s famous line, “Oh, earth, you’re too wonderful for anybody to realize you.” However, Casey Llewellyn’s clever update is also a tribute to Wilder’s remark in Our Town that “People are meant to go through life two by two,” except in her contemporary rewrite it includes couples of all sexual and gender persuasions. While Llewellyn may be preaching to the converted, Dustin Wills’ production is entertaining and theatrical enough to be engrossing however you feel about these issues. It is the sort of play where anything can happen and often does. Dostoyevsky in a modern nightclub sums up this playfully hi-tech and well-performed adaptation of the novel that’s enjoyable but not totally satisfying. Addresses the importance of personal independence while looking at the different ways people deal with hardships brought on by the loss of a loved one.